Have you ever heard the song I Can See Clearly Now? Here are some of the words to it. I tried to stay upbeat here on my blog, but I had been really down and felt like I would never make it back up. I've had that dark cloud hanging over my head for a long time, but now, it's gone! I've been singing this song a lot because I feel so much better now! Praise the Lord! I'm so glad you're feeling better! And what a pretty picture :) Rainbows always seem like a symbol of hope to me. 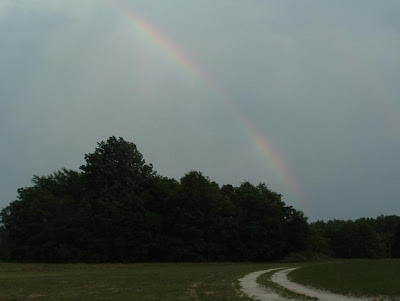 So glad you are feeling better - nothing beats a good rainbow! Thankful that you are feeling better Nancy. Hope ya'll have a great weekend. So glad that God has brightened your countenance and you are feeling better! I love rainbows. They represent such beauty in our covenant with God. Sorry that you weren't feeling great, but I'm so glad that you're feeling better now! Glad to hear you are feeling better! Great pic!!! That is a very nice picture of the rainbow! Keep singing that song. Wishing you sunny days!! You found the rainbow ( symbol of God's promise to us ) and a song that reminds you of sunny days..( the Son does brighten and enlighten ), I am glad you are feeling better. I sometimes have that dark cloud over me too. I'm so happy that your feeling better now! I really look forward to reading your blog. Praise God---the same thing happened to me this week--Weird ;-). What made the difference for me is I started doing some of the things I really enjoy in life--seeing these things as part of the creative instinct that God has richly given us to enjoy. I had been so bogged down with every ones burdens including my own that I finally decided to leave them at the cross . Also listening to Christian music along with all of this has been a factor. Oh Hun, I'm glad that you're feeling better. But you know, I started my blog as a way to kind of keep track of myself - the good and the bad - and I've come to realize that sometimes, by allowing your blogging friends to sometimes know how you're feeling, you give them the opportunity to step up and offer their love and support. It's good for you - and it's good for us too. Rainbows have always been God's way of telling me everything will be okay. Maybe that's what he's telling you with this rainbow. How wonderful! And a great picture as well! Bless your heart honey- I know how you feel. But so glad you're feeling better! !